Lab-Grown Muscle Bundles: A Glimpse of the Future? 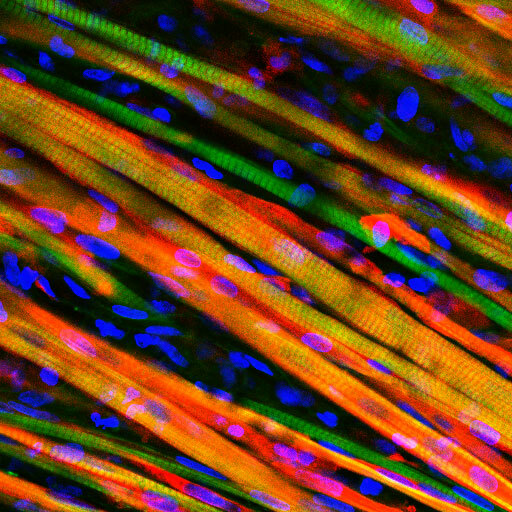 Caption: Engineered muscle fibers are stained with red and green dyes that recognize particular protein markers. The yellow color results from a combination of red and green. The blue dots are cell nuclei. When you do a hard workout at the gym, or run a marathon, you generate lots of little tears in muscle. This is usually not a problem and may even lead to improved muscle strength—because the injury activates stem cells in the muscle (called satellite cells) that replicate and form new muscle fibers to repair and rebuild the damaged tissue. But when injuries extend beyond the normal wear and tear—a major injury or resection, for example—this amazing self-healing system isn’t enough. That’s when a self-healing, lab-grown muscle transplant would be particularly useful—but we haven’t yet been able to create this in a dish. But NIH-funded researchers at Duke University in Durham, NC, have now taken a significant step in that direction. They isolated satellite cells from the muscles of rats, genetically engineered them with marker proteins, surrounded them with a special nutrient rich hydrogel, and grew them in small cylindrical molds for two weeks. The result was an elongated bundle of muscle fibers that spontaneously twitched. When stimulated with electric pulses, the muscle bundle contracted—just like real muscle. And, it turned out to have about the same strength as the muscles in a newborn rat. To test the healing properties of their engineered tissue, the researchers destroyed part of the muscle bundle with a component of snake venom, and waited. Soon, the self-renewing satellite cells came to the rescue and proliferated, repairing the muscle. Then, to determine whether the engineered muscle would survive and further develop in a living animal, they took those twitchy bundles and implanted them on the back of a healthy active mouse and then placed a glass window over the implant, so they could monitor its health and growth more easily. Every couple of days, these mice were sedated and placed under a microscope, where the researchers looked through the glass window to examine the implant. As they watched, the implant was infiltrated with host blood vessels that delivered nutrients to the growing muscle fibers, which became larger and stronger. To help them monitor the function of the implanted muscle, the researchers had genetically engineered the cells to produce a flash of light every time the bundle contracted. As the contractions grew more powerful—a sign the muscle fibers were thriving—the flashes of light grew brighter too. Now that they know the animal’s vascular system extends into the implant, the Duke team is studying whether the nervous system will do so as well. Will neurons innervate the engineered transplant—allowing the animal to flex its muscle? If the nervous system turns out to work like the vascular system, it’s possible these kinds of muscle transplants could be used to repair localized injuries. Biomimetic engineered muscle with capacity for vascular integration and functional maturation in vivo. Juhas, M., Engelmayr, Jr., G.C., Fontanella, A.N., Palmer, G.M., Bursac, N. PNAS Early Edition, March, 2014.